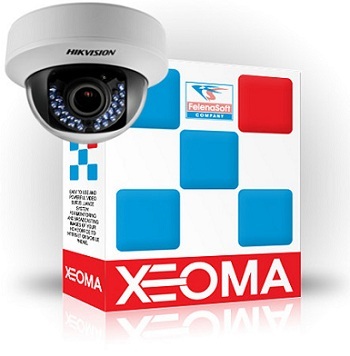 Three best Xeoma Hikvision software programs! There are a lot of indoor cameras on a market, however our customers usually use Hikvision brand. Good performance, night vision and build-in microphone are useful features, aren’t they? We receive a lot of your emails where you ask what sustainable Hikvision software we can recommend. Certainly it depends on your needs. It is a simplified version of the Xeoma video surveillance program. Usually we recommend this Hikvision software for small and medium size business and home users. Lite version includes the most essential and easy to use modules. Connect up to 4 video sources with 6 modules per chain. Please pay attention, that some modules are reduced in this version. More information about Light Hikvision software. This version has no limitations in functionality, number of video sources or remote connections. This type of Hikvision software we usually install at big offices, supermarkets and schools. Visitors Counter module allows you to count employees/students entering and leaving the office/school. Screen Capture module is very much helpful for teachers. You will get the information what is happening on student’s computer screens. Everything is under your control. Isn’t it great? Want to know which program to choose for Airport security? This Xeoma professional Hikvision software offers you an incredible opportunities. Face Detector module will automatically detect person and signal you about the intruder. Object Detector module will notify you if an object is left unattended for some time. Our customers love eMap function, where you can locate cameras on floor plan. In case of emergency you will see camera’s exact position and have an opportunity to send help immediately. Still don’t know which Xeoma Hikvision software suits you best? Contact us! We will help you to make the right choice!